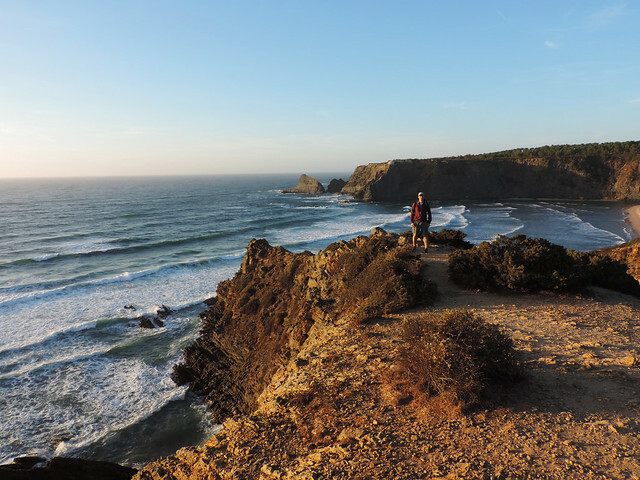 We drove from Sintra to Algarve along the Atlantic coastline and spent a couple of days stopping from time to time for a hike or a beach walk. And for every sunset. To be honest, the drive itself was not very special (in these terms we definitely can’t compare it with California coast). We didn’t even see the ocean for the most part because the road is further from the coast. It’s not to say that the Mediterranean landscape was ugly but the parts we enjoyed the most were when we took short detours to get to the coast and explore beaches and coastal hikes. 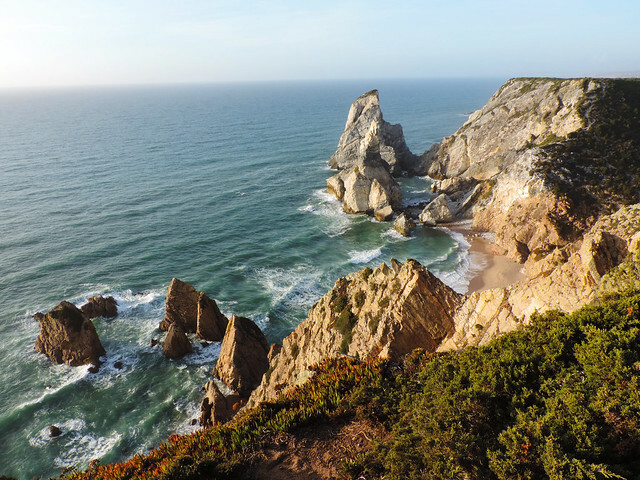 One of the most stunning sections of the coastline is at Cabo da Roca. This lighthouse built on the giant coastal cliffs is the westernmost point of continental Europe. Trails start here both southwards and northwards and it’s hard to decide which direction looks more tempting. 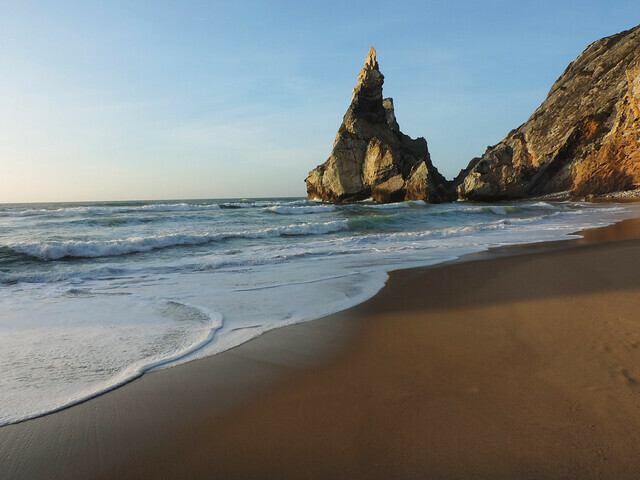 Praia da Adraga is another fabulous beach near Cabo da Roca. 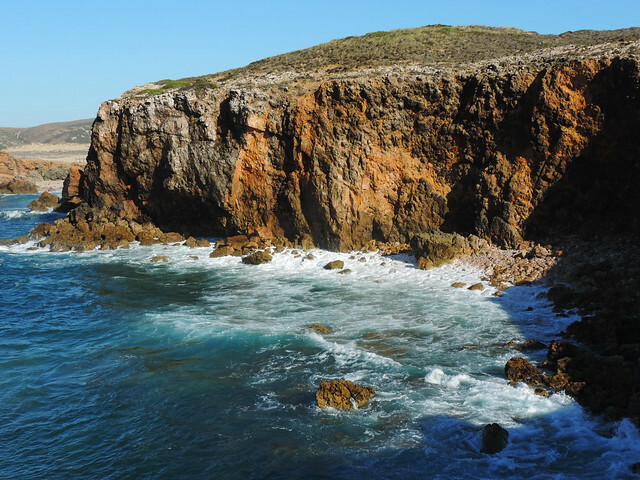 You can probably hike there from Cabo da Roca if you want because it’s part of the long coastal trail. We got there by car after our day trip to Sintra and it was the perfect ending of our day. All looked so idyllic and we haven’t even suspected how tense our next day will be… Until we wake up and found out that the car we rented is not there where we parked the night before. But it’s another story that has nothing to do with the beauty of the coast near Cabo da Roca. 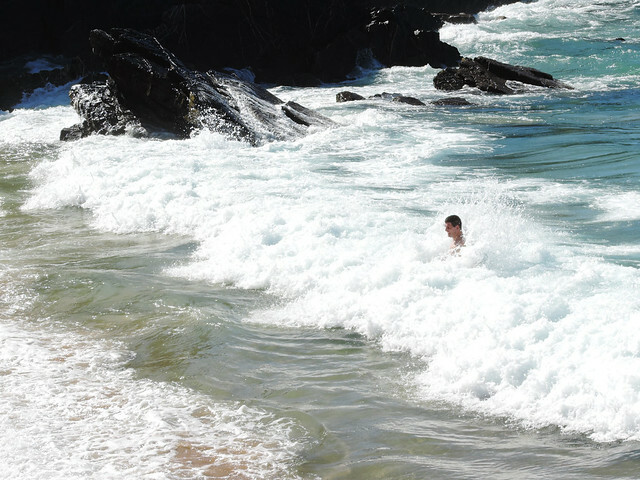 We were looking for another beach but found Praia da Carraca. There were so many narrow roads leading to different beaches that it was not easy to get where we wanted. However the good thing was that we always ended up with a wonderful view. So we happened to find Praia da Carraca instead of what we were looking for but we liked it so much that we stayed for a while. Odeceixe is a lovely beach town with steep little streets, lots of surfers and open-air concerts in the summer. Its beach, Praia de Odeceixe is located at the mouth of Ribera de Seixe and several trails offer views of the river and the majestic ocean. 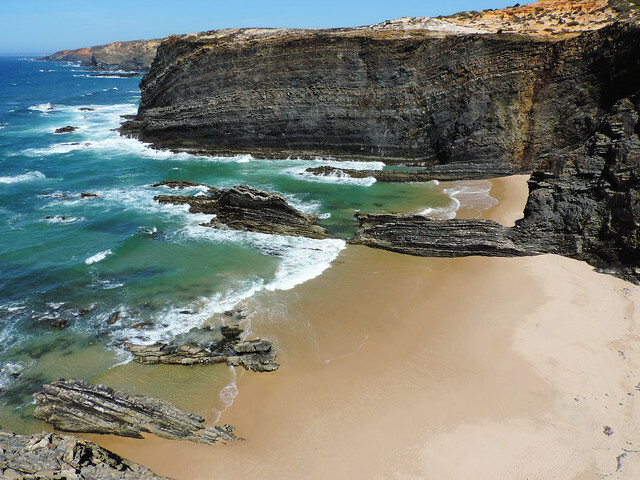 Praia da Amoreira is another beach at a river mouth – the mouth of Aljezur River this time. It’s already part of the Algarve region but it’s facing west and it’s quite windy. 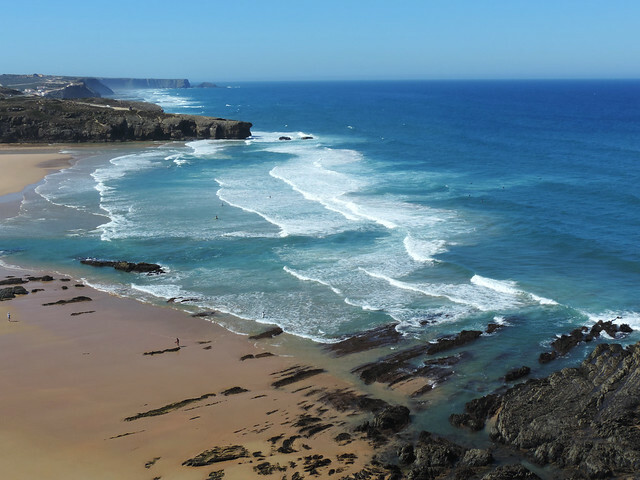 Our favorite thing here was the trail from Praia da Amoreira to Praia da Carriagem. It’s only a small portion of a longer coastal trail but we got stunning views of both beaches from above. On the way there we hiked on top of the cliffs. 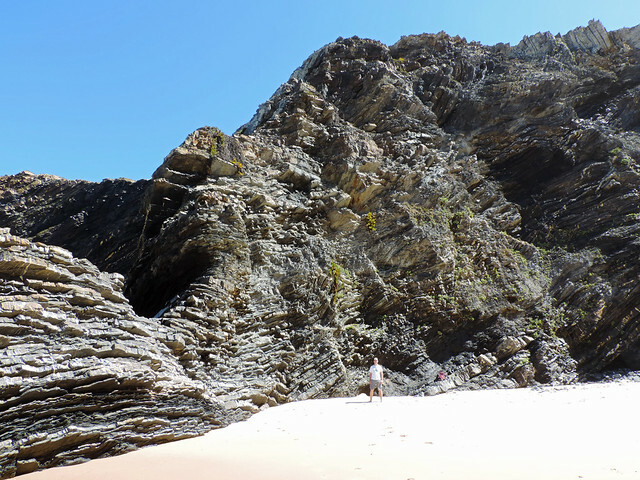 Then we walked down to Praia da Carriagem and walked back on the beach observing tide pools. 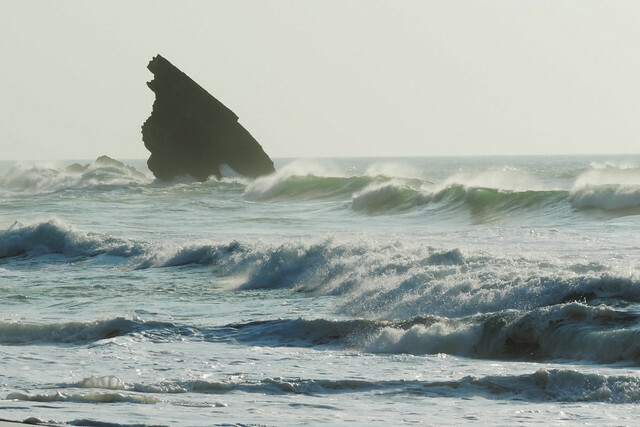 Rugged limestone cliffs and sand dunes make it special to visit this windy surfing beach at the mouth of Ribeira da Bordeira. Series of wooden stairs and boardwalks start from the beach and offer amazing views of Praia da Bordeira and a countless smaller, hidden bays next to it. Of course, all these activities wouldn’t fit in a single day. We spent 2 nights in Sintra and another one in Odeceixe. The place we stayed in Odeceixe is called Hospedaria Firmino Bernardino and it was our favorite place to stay on our whole trip to Portugal. Our room was spacious and comfortable with a pretty balcony, and our host was friendly and eager to recommend anything that could be of interest. It’s not walking distance from the beach but since we had a car it took only a couple of minutes to get there. Do you like being near the ocean? Any favorite coastal walks?